- CINQUE PISCINE (piscina coperta, piscina per lap / lounge, piscina per tuffi, piscina con cascata / scivoli, piscina per bambini, piscina con estremità bassa) - QUATTRO VASCHE CALDE. - TRE PARCO GIOCHI - SALA ESERCIZIO - BASKET - PICKLEBALL ...... così divertente !! Questo bellissimo condominio One Bedroom / One Bath è perfetto per una fuga romantica e anche per una vacanza avventurosa per una piccola famiglia. La vista dal 3 ° piano balcone è spettacolare. Con ascensore, questo condominio è facile per tutte le età di godere. I proprietari hanno aggiunto nuovi elettrodomestici e piastrelle in bagno e cucina insieme a nuovi tv a schermo piatto, sgabelli da bar e set dinette, futon soggiorno, WiFi gratuito, insieme a parcheggio gratuito, l'arredamento del condominio è caldo, confortevole e vi farà sentire bene a casa. Sicuramente un prezzo giusto !! 1. St. George gode di oltre 300 giorni all'anno di sole. Il condominio è vicino a GOLF, TENNIS, MTN BIKING, CAMPI DA BALL, ESCURSIONISMO, PESCA, le migliori attività all'aperto che San Giorgio ha da offrire. 2. Zion Parchi Nazionali, il Parco Nazionale Bryce, Arches National Park, Cedar Breaks National Monument, Capitol Reef National Park, Lake Powell e il bordo nord del Grand Canyon sono tutti vicini e 'deve vedere' posizioni. 3. Las Vegas e Mesquite, Nevada sono entrambi a breve distanza dal familiare St. George. Navetta da St. George giornaliera (controlla tariffe all'arrivo). 4. St. George ha campi da golf impressionante a prezzi accessibili tutto l'anno. 5. Miglia chilometri di piste a piedi / ciclabili per grande esercizio aria pulita. 6. Gente cordiale, ansioso di fare il tempo a St. George divertente, piacevole, e rilassante. 7. Grandi montagne di classe mondiale mountain bike. 8. Molti eventi tutto l'anno evidenziano il St. Zona George compreso il teatro all'aperto Tuacahn a Snow Mountain; Giochi mondiale senior; il St. George Marathon. 9. Tra i servizi dell'hotel che boggle la tua mente. Piscine, Jacuzzi, Parco giochi per bambini, ecc. Accesso 10. Green Valley a pagamento a prezzi accessibili per Raquetball, piscine aggiuntivi, campo da tennis coperto, centro benessere, sala pesi, etc. Questo condominio ha sua propria lavatrice / asciugatrice !!! SI PREGA DI EMAIL PER DISPONIBILITA 'E DOMANDE !!! Le telefonate non possono essere restituiti al più presto una e-mail. I was a little disappointed that it was not very clean, but other than that I really enjoyed staying there. I will do that again. Nice one bedroom unit. Very nice view overlooking St. George, especially late evenings and early mornings. The picturesque snow covered Pine Valley Mountain was splendid. Very clean inside, although a bit dated, but so am I. Everything worked just fine, so no problems/complaints. Whether it was the miles of hiking every day or the quietness of the complex, we slept very soundly each night. We thought the bed was extremely comfortable. Even though we were there during spring break and many children present, we heard very little noise. Enjoyed the pool area and other amenities in the complex. 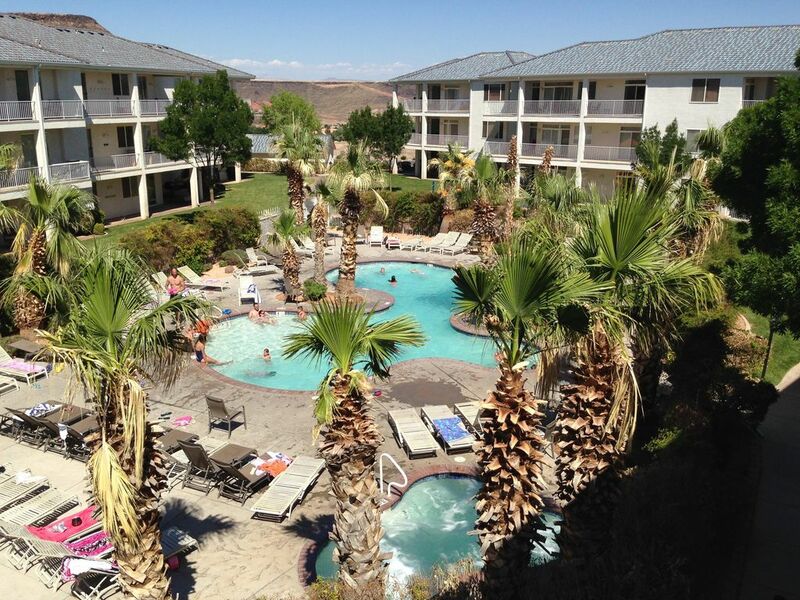 Excellent location in St. George and surrounding areas. We would recommend staying with this host and condo, as we will certainly attempt to re-book in the very near future. The condo unit is very clean, well maintained, and well stocked with basics. We enjoyed our stay. The property grounds and facilities appear to be having a hard time keeping up with maintenance. But the individual unit that we stayed in (#329) is in good shape and very clean. We visited St. George to enjoy the outdoors, State and National Parks in the area, and this property was perfect for our needs. Very convenient and in a nice area and a good value for the price. Very clean, smaller than we thought. Unable to stay the entire time. The key was a bit of a pain for us, but other than that it was good..
Hi Shirley. Thanks for staying with us. We are working with our awesome housekeeper on a solution for the key. Come again soon!! My daughter, granddaughter and I felt very comfortable here - booking way in advance was a little nerve racking, but check-in and out was flawless- was a little concerned by some of the reviews but dont hesitate booking this condo - it is a little out dated but some people are petty with their remarks - Brian thankyou for offering your condo up for rent to strangers - we had a good time.